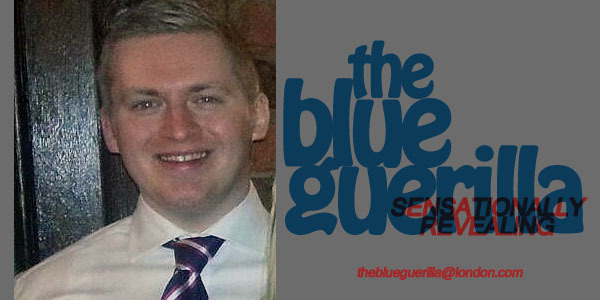 TheBlueGuerilla: EXCLUSIVE: Liverpool Tory Youth Executive Elected Uncontested. EXCLUSIVE: Liverpool Tory Youth Executive Elected Uncontested. Aaron Hugh Ellis has been re-elected Leader of the Tory Youth brigade in Liverpool and has today exclusively taken part on a Q&A session with tbg. Aaron is a Scouser, he says the Tory brand still needs detoxifying in Liverpool and talks about how he will achieve this. Aaron also touches on Liverpool's strained relationship with Wirral Conservative Future (CF) and the City's CF AGM that took place this week. I had scrambled eggs and salmon on toast, which helped alleviate my hangover a bit. tbg understands you were uncontested for the position of Liverpool Tory Youth Leader at last night’s AGM until a last ditch attempt at a challenge, can you expand on this? Well, there was some confusion over issues to do with membership, which took up a lot of time, but it was eventually resolved and all the candidates were uncontested. I like to think it shows how united Liverpool CF is, which unfortunately can be the exception rather than the rule in a lot of Conservative Future branches. Anything else interesting discussed at last night’s AGM? We adopted a constitution finally. It was something I was very eager to do, as if you don’t sort out all the little bureaucratic stuff early on, it distracts you from more important things. Anthony Trollope’s The Prime Minister: It’s about whether a good person can be an effective leader. I’m not that far into it, though, so who knows…? Has the relationship between you and Wirral CF improved at all? I don’t have one. When I was a kid, I was addicted to a bad combination of Dr. Pepper and Starburst Joosters, and that pretty much put me off fizzy drinks for life. Can Liverpool CF help achieve any kind of headway for the Tories in the City? I want to make us essential. As a Scouser, I’ve grown up knowing the kind of issues that confront the Party in Liverpool, and we really need to ‘detoxify’ the brand here. I want CF to lead that effort, and I also want us to play a very big part in organising the local election campaign next year. What’s next for Liverpool CF? We’ll be debating Labour next week about whether Thatcherism was good for Britain, which will be a lively discussion. There’s also going to be an event on Tory foreign policy, with the Prime Minister’s Envoy to North Africa as a speaker. And the new committee is already starting to plan a lot of events for after the summer, including a day conference we want to do about the 2015 General Election, kind of like the one ConHome did recently.